The oven is ready! Learn new words with the great cookie assortment Cookid Teaching Jar! Cut, stretch and crush cookies to find surprises hidden inside them. Get rewards for knowing the name of every surprise and unlock new levels. Who can resist a jar of freshly baked cookies? -Interactive words: visual and funny learning. -Constant reinforcement of learning through rewards. This is a fun educational game with music and pictures that are just right for the age group targeted by this app. The word-association approach they’re using can be difficult for young kids but early readers will be able to catch on easily. 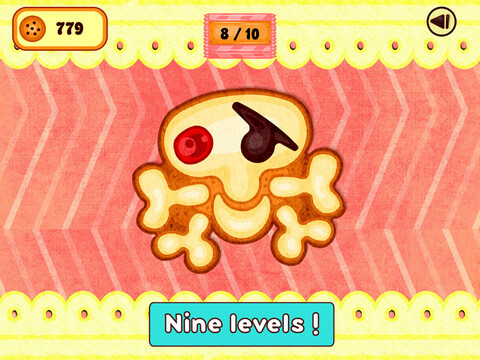 It takes full advantage of the touch features of the iPad because players need to pinch, pull, and drag cookies around the screen. Also, it’s very kid-friendly because there are no in-app purchases, web links, advertising, social media, etc. A full review will be coming soon. Cookid Teaching Jar is rated 4+ and is currently free for a limited time. Requirements: Compatible with iPad. Requires iOS 5.1 or later. Free App Fridays brings you interesting, educational, and fun apps with great value. Free and discounted apps are generally available for a limited time. This offer has not been confirmed outside of the US.